He sits with women. When trouble comes, the mamas and widows gather at the edges of peril and my husband finds them. He joins them. Last week flood waters rushed in overnight killing some of the most vulnerable children and displacing over fifteen thousand families from their homes. Almost as fast the Red Cross erected at makeshift camp on a nearby soccer field. At the invitation of the director, my husband drove out on the first day to survey the situation and agreed to sponsor the camp. He gravitated to the women, all sitting together surrounded by children and swaddling the tiniest ones. He sat among them, listening to their stories of loss and sharing in their sadness. Tears, groans and sighs all in an attempt to exhale the heaviness of the day. He sat with them for hours, refusing to rush their lament. He confessed to me that he cried, too. As he told me about the rest of his day, other scenes flashed before my eyes. 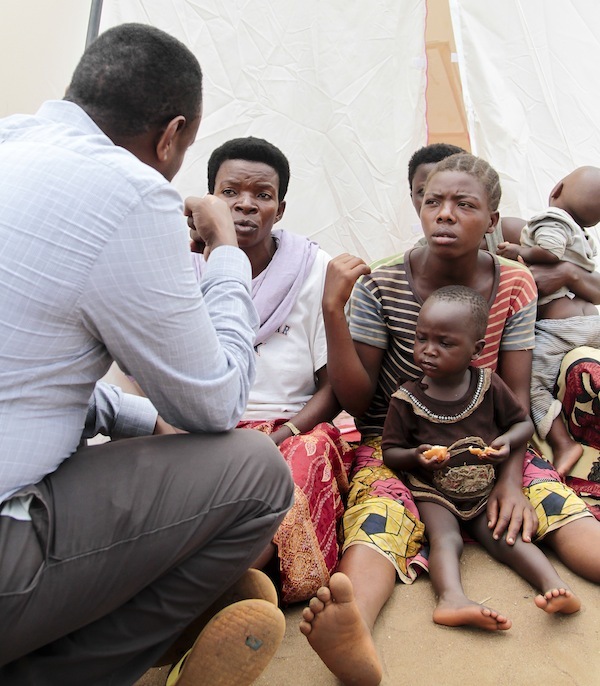 When the marketplace fire destroyed the hub of the local Burundian economy one Sunday, he sat with the women on Monday morning. One told him, “We went to bed as business women and woke up poor.” He listened, unhurried by the demands of the day; he stayed with them. A few days later he invited them back and offered them Fanta and donuts, he made space for them to sit and tell stories of lost kiosks and inventory, not enough money to buy food for their families, the fears of being locked out of the economy. Again, he witnessed their heartbreak. Together they spoke, cried and prayed. Just this past December he heard rumors of patient prisoners held at a local hospital, trapped there because they couldn’t afford to pay their bills. He decided to investigate. He found sixty-eight women in the dismal courtyard, sullen and despondent after months of captivity. He sat with them. He listened. The words pierced him. He couldn’t conceal his sobs as he told me about their conditions. Some were dipping into depression and saw no hope for any other kind of a future. His morning plans instantly derailed as he committed to hours with these women, mourning side by side. Once our phone call ended, I realized the story all these images told me. He sits with women as they mourn. He is unafraid of their pain. He enters into the rawness of loss and listens well to their lament. Eye to eye, hand in hand, he touches them and is touched by their despair. He holds the space for them. He hallows the space, somehow. If we believe the prophets, grief must be given voice. The devastation pressing from the outside, the despondence rotting bones from the inside must cry out. After the loss lament needs her say. Traditionally it’s been a band of women who learn the songs of sadness and act as a catalyst for the community. They go first with howls of anguish cracking the veneer, summoning the courage to say things are not yet right among us. Their tears make way for others to cry so an entire community can address their pain and collectively suffer the loss. Only then, when lament at last rests, can hope emerge. Only then, once the ground is fertilized with salty tears, can the seeds of hope sprout. So thank God for the women who weep. They prepare the way. I wonder if my husband intuitively knows what the prophets know – grief is the seedbed of hope. Go to the place of pain, sit there and listen, allow yourself to feel the discomfort and even the hot tears scalding your cheeks. The Spirit works through the lament for those who have ears to hear, eyes to see and time to sit with sadness. And if the Spirit is at work amid the lament of these women, then my husband sits in the perfect position to discern the tender spots; the deep needs and maybe even anticipate the direction hope will enter from. Hours shared in grief may be the most holy and hopeful thing he can do. He sits with women. And in that moment, I could not love him more. Really beautiful tribute to a beautiful man, Kelley. Prayers for Burundi always!